SHEsaysWITHaSMILE.blogspot.com: No, we have not been photo-shopped in..
No, we have not been photo-shopped in..
-that really is (me!) & (my sister!) BBQ'n. -so there..
"Thank you!" here to our dad who gifted my sister with her very own BBQ for her recent birthday. "Thank you! to Ricks Picks!.. for a great deal.. " Thank you!" to Chris Lampson for helping educate us about the chain-thing designed to ..?... 'Oh! it holds matches..'. And for helping us discover the ignition was not broken.. "You just pull it out.. remove the plastic.. there's a battery.."
and "Thank you!" 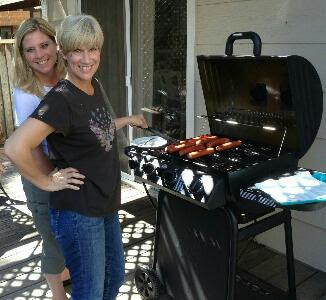 to our brave mom and her husband.. and the kids for not laughing.. remaining calm.. and insisting these were the best hot dogs ever..
i mean, -not just anyone can heat up a hot dog.. -write. next: hamburgers. and if the house is still standing after that.. Kabobs.. if no alarms go off that night.. we will BBQ some tri-tip..
-there is no stopping us now..